Environment Canada has issued a snow squall warning for much of southern Quebec, warning that brief, but intense snowfall is expected. Heavy snow and blowing snow will significantly reduce visibility, the agency says. 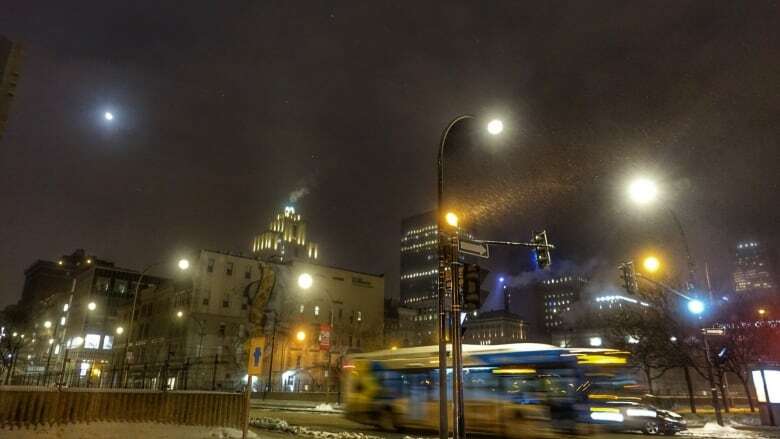 Environment Canada has issued a snow squall watch for much of southern Quebec, warning that brief, but intense snowfall could suddenly reduce visibility. Snow squalls are expected in the late morning to early afternoon Sunday, bringing about five centimetres of snow to the Montreal region. Heavy snow and blowing snow will significantly reduce visibility, the agency says. Thick flurries combined with moderate to strong westerly winds will give near-zero visibility for a short period of time. Temperatures will vary between –1 C in the early afternoon and –13 by 11 p.m., feeling like –22 with the wind chill. The snow squall watch, in effect since about 4:40 a.m., covers Longueuil, Châteauguay and the island of Montreal. There is also a snow squall watch in Beauce, Quebec City, Richelieu Valley, Drummondville, Kamouraska, Montmagny, Témiscouata, Vaudreuil and the Eastern Townships. Snow squalls cause weather conditions to vary considerably, Environment Canada says on its website. Changes from clear skies to heavy snow within just a few kilometres are common, causing sudden reductions in visibility. Snow squall watches are issued when conditions are favourable for the formation of bands of snow that could produce intense accumulating snow or near-zero visibility, the agency says.